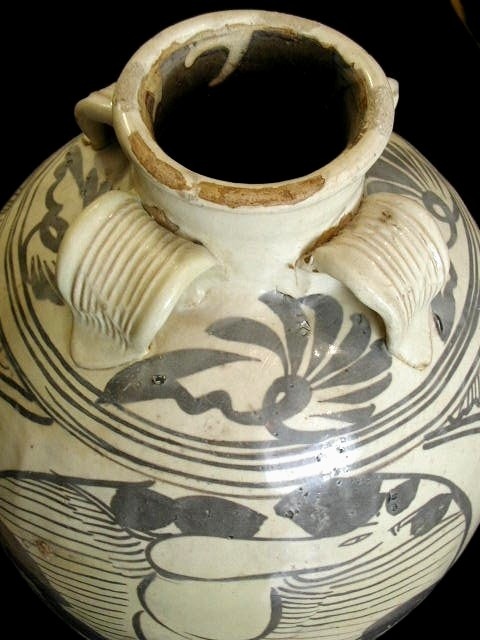 Close up view of a large glazed painted jar with two birds with their expanded wings, as performing a mating ritual dance, within stylized foliate design over a white glaze on the upper half section, with four ribbed handles in the shape of leaves protruding from the base of the neck; as the lower half uniformly covered with a grayish brown glaze. Yuan Dynasty (AD 1279-1368). H. 22.5 in (57 cm).